Teaching Young Writers: I Chalk! If you had the chance to share poetry and chalk illustrations to celebrate poetry, would you? Back in March my husband was outside with our children doing chalk on the driveway. He got the idea to write some song lyrics. This idea of writing words on our driveway spread. I started writing poems, then my husband started writing poems and song lyrics of his favorite singers. It has been fun. Then, I began thinking, what if others shared writing underfoot? What if someone, somewhere wrote their favorite poem or an original poem and someone else stumbled upon it? Instant smiles is what I thought. Soooo...I would love it if you would join me at the end of the month and share some chalk here at Teaching Young Writers. From your favorite poet or from your own notebook, put a poem on a piece of ground somewhere (asphalt, sidewalk, maybe even a fence--just make sure it is appropriate and legal). Illustrate it if you want with chalk too and take a photo! Post it to your blog and link here on Chalk-A-Bration day. Should be fun, tell your friends, tell your students and get chalking! Wow - what fun! Off to find me some chalk! Will do Betsy-terrific idea & such fun to start thinking about. I'll tell others too. Thank you for wanting to do something & share! What a great recess idea! I have duty next week. We are currently working on poetry, so I'm going to encourage some chalk. Thanks for sharing! What a fantastic idea! I used to teach a summer class, and when the girls showed up, they would always find quotes in chalk on the road. Now I am going to think about what poem to chalk out on our very sleepy road... I will post this to The Poem Farm Facebook page! a. Great fun! We will join you in your chalkpedition! Pics to be posted soon at thinkinginrhyme.blogspot.com! Thanks for the clever idea! Fun! I will join you in your challenge with my kdg kids! Can't wait to see what comes of it! The book Chalk by Bill Thomson would be a great book to read with this activity - it's a wordless picture book but brings chalk to life! Oh, me, me! I want to do this! Tomorrow I'm going on a trip to the Poet's House in NYC with some kindergarteners. 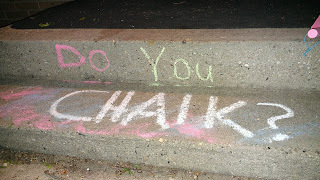 (http://www.poetshouse.org) I'm sure we can dream up some chalk-y goodness for April 30th! What a wonderful idea! I will not be able to join in this time, but I do hope you do this again -- as a monthly series perhaps? I'll be back to see what everyone did! Thanks for having a party to end National Poetry Month. I agree with Renee -- you should make it a monthly feature!! My class is so looking forward to the chalk-a-bration!!! We look forward to seeing everybody else's! HI Betsy! I wanted to share my blog post for Chalk-A-Bration.. I'm definitely going to join-in next month (on Halloween?!!?). The Littlest of Poets Revealed! Books That Are Speaking To Me! Non-Fiction in Kindergarten Day One and Two!